“Hammers, axes, swords, daggers, pickaxes, tongs, and also instruments of torture, they make very well, or get other people to make their design, prisoners and slaves that have to work till they die for want of air and light." Order your own copy of The Fate of Wilderland at your local retailer or online through our website today! Your mission in Rhovanion has challenged you like never before, forcing you to climb treacherous mountain paths and stand steadfast in the face of a Dragon's fire to restore peace to a troubled land. You were pushed to within an inch of your life, but you managed to survive. It should be over. You should be allowed to go home, but Fate has other plans. Throughout this cycle, which began in The Wilds of Rhovanion, you have sought to resettle your Haradrim friends into a new life far from the shadow of Mordor, but safety has always been just out of reach. You have chased whispers and rumors across the Iron Hills in search of a fiery foe greater than any you have faced before, and stood before the glinting eye of Dagnir herself. Now, when all should be said and done, you must fight for your lives as the mountain you have liberated falls under siege. 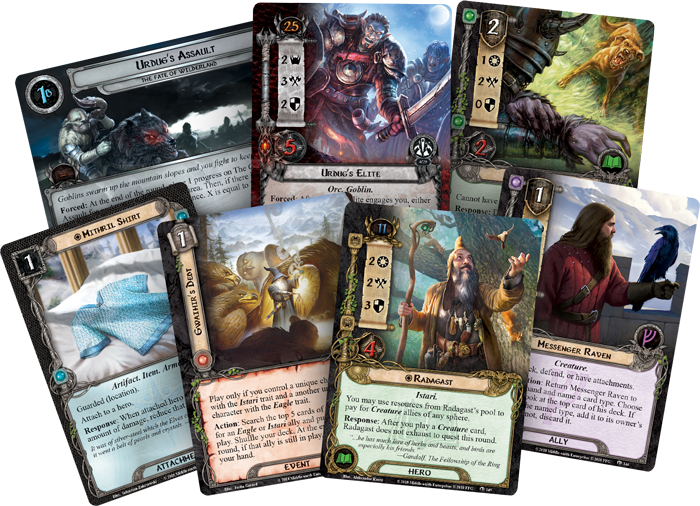 Fantasy Flight Games is proud to announce The Fate of Wilderland, the sixth and final Adventure Pack in the Ered Mithrin cycle for The Lord of the Rings: The Card Game—now available for pre-order at your local retailer or online through our website! Your delve into the mountain depths in Mount Gundabad was meant to be the end of your harrowing quests in Rhovanion, but you are far from safe. In a move long-planned, one whom you once thought your ally has returned with an army to lay claim to Gundabad and the dragon’s hoard. In Urdug's Assault (The Fate of Wilderland, 168), Goblins swarm up the mountain slope, surrounding your party, and you have no choice but to fight them back. You know the fate that awaits you if you should fail… victory or death are the only options. In an adventure that feels like it came straight from the pages of Tolkien’s work, The Fate of Wilderland puts you in the middle of a grand battle right at the moment when your only thoughts are of the return journey home. This is no small, loosely organized band of Goblins like you are used to seeing in the Iron Hills. 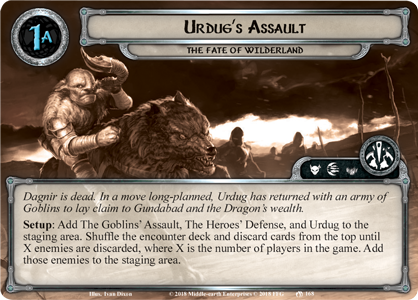 As the fight rages on, you will be pitted against Urdug's Elite (The Fate of Wilderland, 158). Once this group of advanced fighters engages you, you must either exhaust one of your characters to hold back the assault for just a moment, or allow the Goblins to add progress to the quest. And the betrayer himself is the worst of all. 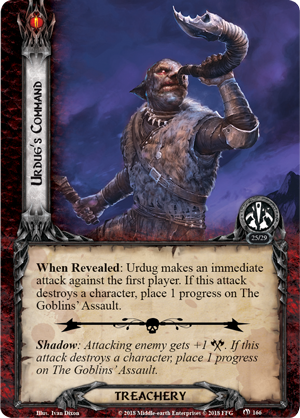 At Urdug's Command (The Fate of Wilderland, 166) the Goblin leader makes an immediate attack against the first player in your party, and if he can strike them down, his dark army will be one step closer to victory. In this final challenge, you cannot afford a single slip. 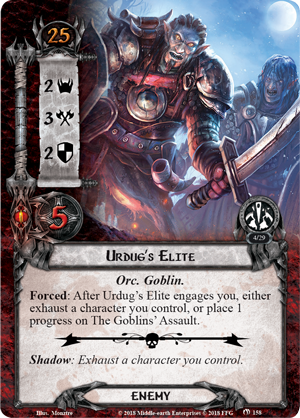 As you stand outnumbered by the Goblin swarm, you will need every ally you can find, and the more powerful the better. While he may be known for peace, there is one hero who resides in Rhovanion that may be sympathetic to your plight and lend his strength to your cause. Ever since he first came to Middle-earth, Aiwendil, now known as Radagast (The Fate of Wilderland, 145), has been a tender of the beasts and birds of Middle-earth. Even the Great Eagles and Beorn consider him a friend. 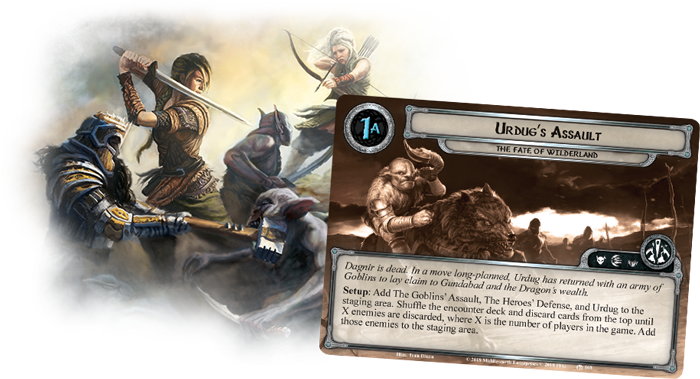 While he has appeared as an ally (A Journey to Rhosgobel, 59) in the Shadows of Mirkwood cycle, the Wizard’s inclusion as a hero in this Adventure Pack gives you the opportunity to explore deckbuilding opportunities centered on the rare Istari trait. When the Wizards first arrived in Middle-earth, Radagast unwittingly used his connection to the creatures of the world to have them act as spies for Saruman, believing that he was using his power to help keep watch on the stirrings of Sauron. 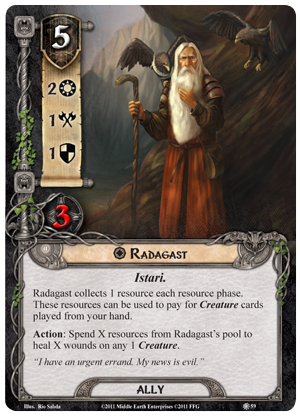 Radagast can still use his connection to the natural world for the forces of good. 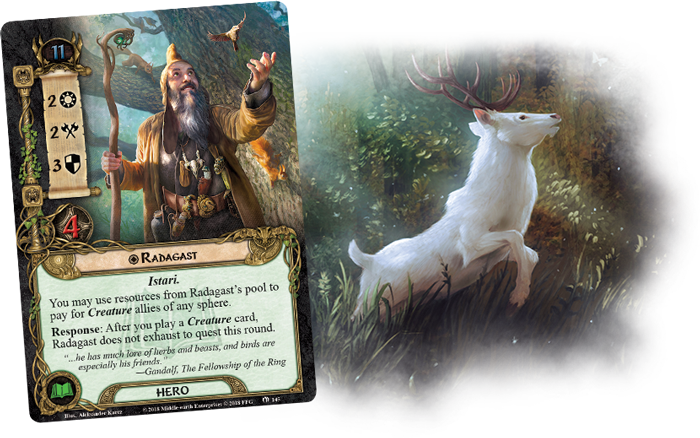 If you play a Creature card during your turn, Radagast will not exhaust to quest, sending his beloved animals to scout ahead. 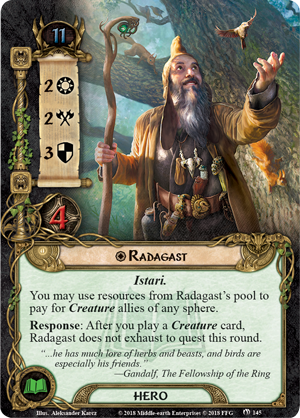 And these allies need not be directly under the Brown Wizard’s influence sphere—while Radagast has an emphasis in Lore, he can use his resources to pay for Creature allies of any sphere. 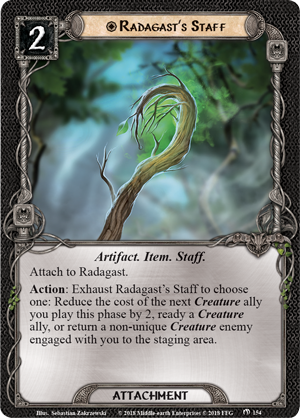 The Wizard’s sway over the beasts of Middle-earth is further increased with Radagast's Staff (The Fate of Wilderland, 154), which lets him use an Action to either ready a Creature ally, reduce the cost to play one of these allies by two, or repel a non-unique Creature enemy to the staging area. 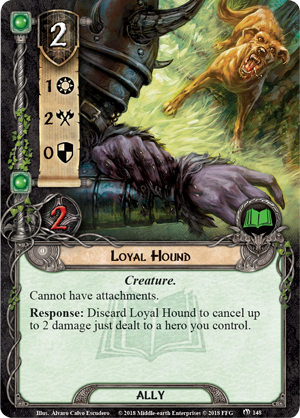 This means that Radagast can bring an ally like a Loyal Hound (The Fate of Wilderland, 148) into play for free, then proceed to quest while staying ready to combat whatever obstacles are revealed from the encounter deck. 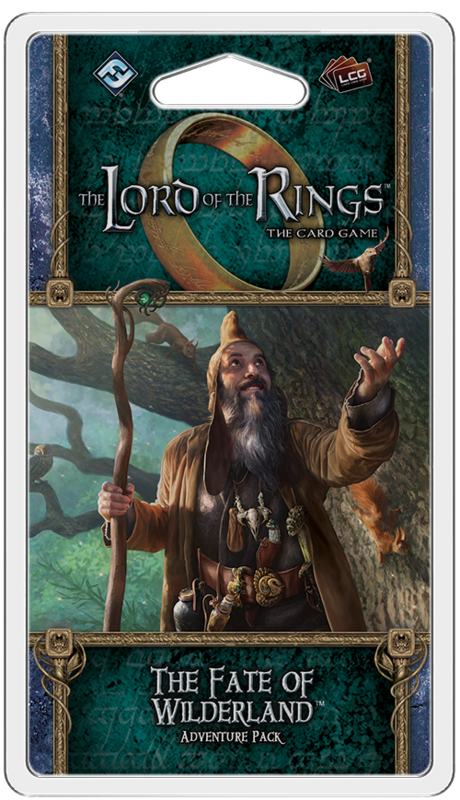 With the aid of the wilds, Radagast is ready to stand against the forces of the shadow in Middle-earth! You have freed the region from the terror of the Dragon's fire throughout the Ered Mithrin cycle, but the land is still in peril. You may be weary, but you have come too far to surrender now. The Fate of Wilderland is in your hands—are you ready for the challenge? This Adventure Pack will hit retailers in the second quarter of 2019. You can pre-order your copy of The Fate of the Wilderland (MEC71) at your local retailer today or online through the Fantasy Flight Games website here!